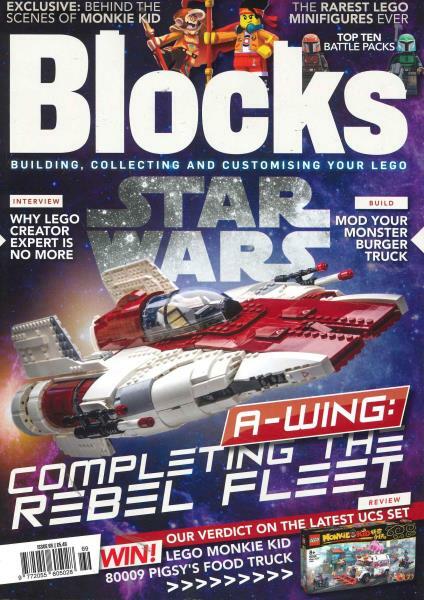 Blocks is the title for Lego enthusiasts and is aimed at the thousands upon thousands of lego fans, of all ages who enjoy collecting, building and creating Lego dioramas, layouts and models.Buy a single copy or subscription to Blocks magazine. Each issue is 130+ pages and it is structured in such a way as to appeal to both newcomers to the LEGO hobby as well as hard-core LEGO fans. This magazine celebrates everything to do with LEGO. Aimed at both the young and old, it is a perfect gift for enthusiasts who want to immerse themselves in the world of plastic bricks who want to take a break from building their latest projects. Blocks showcases the latest big releases from LEGO and give in-depth reviews and opinions from the industry. Focused on the biggest and smallest projects covering all palates, be it LEGO Space, LEGO Simpsons or LEGO Creator, it showcases some of the best custom builds from around the world with interviews from the people behind them. Offering useful hints, tips and how to’s, inside information from LEGO experts that'll help you get the most our of your hobby. This magazine was put together by LEGO fans and industry experts and is a must buy for any real LEGO enthusiast.